I hope you have all had a good Christmas and are looking forward to a Happy New Year. Here is the latest Respect Our Seas Marine News Roundup. Scientists have recently discovered and described three "previously unknown species" of carnivorous sponges from the family Cladorhizidae. The scientists say that one resembles a "tiny shrub", another has tiny bones that resemble the "jaws of a great white shark", and the third like "crochet-hooks". They were discovered in the deep waters off New Zealand and Macquarie Island, an Australian sub-Antarctic territory. Killing marine mammals for food has increased over the past few decades worldwide - often by tropical zone fishermen netting animals in situations without controls to avoid overharvests - according to a new study that examined 900 sources of information across the globe. Conserving shark species in the deep waters of the Great Barrier Reef is a challenge for shark researcher Cassandra Rigby. The James Cook University PhD student said information on the age, growth and reproduction of deep water sharks was limited – despite half of the world’s 1200 species of sharks and rays living in deep water. This information was crucial in conserving populations, but a new tool being developed may be a breakthrough. Russian sailors tipped rubbish into the Moray Firth as they sheltered from stormy weather. The crew of the aircraft carrier Admiral Kuznetsov were spotted chucking bin bags into the sea – a sanctuary for seals and bottlenose dolphins. The 65,000-ton ship was one of several Russian navy vessels sheltering from the the weather in international waters. Legislation that sets crab pot limits may soon help fishers in California. The legislation will lighten competition from large boats and ease the chaos of the season's opening weeks by limiting fishing. Fishers catch most of the Dungeness crab for the entire season during the early days and the season ends in June and the crab pot limit would reduce fishing at the beginning and instead stretch it out throughout the season. Fishers and experts believe this could help protect the local fishery. Just when you thought it was safe to go back in the Gulf of Mexico, a new menace, this one striped like a big cat, is preying on aquatic life: The black tiger shrimp. The biggest saltwater shrimp in the world, black tigers, are cannibalistic as are other shrimp but it’s larger so it can consume the others. Because of the threat of disease, the predatory intruder poses a problem for the native shrimp and oyster population of the Gulf. Those festive balloon releases that take place around the holidays aren't that festive if you're a sea turtle. The Florida Fish and Wildlife Conservation Commission warns people planning parties around New Year's or football games that balloons usually end up in the ocean or other water body. Sea turtles mistake balloons for food, and the strings can entangle birds and other animals. State law prohibits the release of more than nine lighter-than-air balloons within a 24-hour period. In its age-old war to keep back the sea, low-lying Netherlands has dumped sand onto a surface larger than 200 football fields just off the coast - and will wait for nature to do the rest. The Dutch authorities hope that the sand will be driven landward to form a natural barrier against the North Sea's relentless onslaught. In a submission to the Ministry of Fisheries, the Environmental Defence Society (EDS) has called on the government to reconsider proposals for the Auckland Islands squid fishery. The New Zealand sea lion is an endemic species, found principally in the Auckland Islands. The population has been declining for a number of years, and in 2010 the Department of Conservation reclassified the species as 'nationally critical', the most endangered category available in the classification system. Research shows that squid fishing is probably a key cause of the population decline. Underwater earthquake recordings could help track the endangered and poorly understood fin whale, according to research presented here last week at the annual meeting of the American Geophysical Union. Most quake researchers cull the whale’s booming calls from their seafloor recordings. But one group of seismologists has flipped things around to harvest an extensive repertoire of fin whale songs. The RNLI came to the rescue when a seal became stranded on Mablethorpe beach. The female adult grey seal was found on the beach by a member of the public who reported it to the Mablethorpe Seal Sanctuary. When the Seal Sanctuary were unable to move it the RNLI stepped in to help. Lifeboatman Paul Hills was able to lift the injured seal to the sanctuary. Efforts to help people with learning impairments are being aided by a species of sea snail known as Aplysia californica. The mollusk, which is used by researchers to study the brain, has much in common with other species including humans. Research involving the snail has contributed to the understanding of learning and memory. The United Nations has launched the Decade on Biodiversity with Secretary-General Ban Ki-moon encouraging humanity to live harmoniously with nature and to respectfully manage its assets for generations ahead. The General Assembly previously declared the period 2011-2020 as United Nations Decade on Biodiversity to promote the implementation of a strategic plan on biodiversity and its overall vision of living in harmony with nature. Scientists in Alaska are investigating whether local seals are being sickened by radiation from Japan's crippled Fukushima nuclear plant. Scores of ring seals have washed up on Alaska's Arctic coastline since July, suffering or killed by a mysterious disease marked by bleeding lesions on the hind flippers, irritated skin around the nose and eyes and patchy hair loss on the animals' fur coats. Biologists at first thought the seals were suffering from a virus, but they have so far been unable to identify one, and tests are now underway to find out if radiation is a factor. Jeanette Longley took the plunge when she saw a stranded shark on the beach at West Bay. She became soaked as she wrestled with the creature to drag it back into the sea after it was swept ashore near the seafront chalets. The 56-year-old rolled the 5ft fish down the shingle and was buffeted by waves as she made several attempts to pull it back out to safety. Coastguards said they understood why Jeannette tried to save the shark but warned people against taking risks. A spokesman urged people to call them in such situations as officers are specially trained and have such equipment as dry suits, life jackets and lines. A spokesman for the SeaLife Centre in Weymouth said it was unsure what type of fish it was. That's it for 2011 - we will be back in 2012 with the next Marine News Roundup! I hope you enjoy this week's Marine News Roundup - leave a comment below and let me know what you think! The latest blog from BBC Earth takes a look into the diverse life forms that not only survive, but thrive in the darkest depths of our planet. Without sunlight, life on Earth would not exist. Every organism that has evolved on the surface of our planet has received energy either directly or indirectly from the sun. Even creatures that lie at the depths of our oceans and have never felt the sun’s rays, not only survive but can actually flourish thanks to solar energy. 120 kilometres off of the Californian coast at a depth of 1,250m a diverse ecosystem is thriving in the darkness. 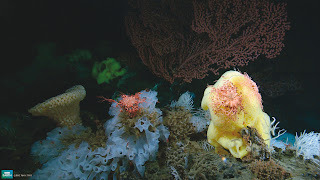 Rising up 2280 metres from the seafloor, the Davidson Seamount, an underwater mountain, is an ‘oasis in the deep’. Thought to have formed between 9 and 15 million years ago from volcanic eruptions, the ancient seamount is home to some of the slowest growing communities in the ocean. For example Paragorgia arborea more commonly known as pink bubblegum coral, grows to over three metres in height and is over 100 years old. But how has this seamount managed to sustain more biodiversity with a higher species count than that of the neighbouring seafloor? Its elevated position creates complex current patterns which influences what can live there. The mountain provides a place for species, such as coral, to attach to it which in turn provide food and shelter for other species. 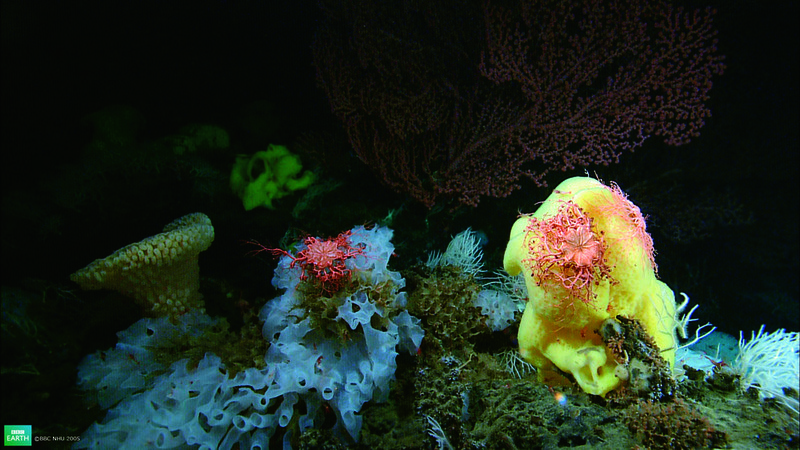 Due to these unique conditions seamounts demonstrate a high degree of endemism. Much of the deep sea is fed by the "compost" or “marine snow” from the upper sunlit portions of the sea. As plants and animals at the surface die and decay, they fall toward the sea floor. This snow provides carbon and nitrogen to feed many of the scavengers in the deep sea; testament to the fact that the sun’s rays touch far beyond where they can be seen. But what happens when there are no nutrient-rich currents to feed from? No organic material falling down from above? Or when the extreme conditions make life almost impossible? Over the last 30 years, researchers have discovered deep sea-ecosystems that live independently of the sun’s energy. These communities survive by utilising chemical rather than solar energy. Deep-sea organisms such as mussels, shrimps and squat lobsters host methane fixing bacteria, which convert the chemical energy from methane bubbling out of the sea bed into nutrients. In this remarkable video from BBC Earth’s Life series, David Attenborough shows us exactly how an assumed barren seabed, became an abundant source of food and life. The United States, Australia, the Netherlands and New Zealand have voiced their opposition to commercial whaling, expressing disappointment about the recent departure of a Japanese whaling fleet for the Southern Ocean and denouncing any actions that imperil human life. In a joint statement, the governments of the four countries said they "jointly condemn any actions that imperil human life in the Southern Ocean," as they are "deeply concerned that confrontations in the Southern Ocean will eventually lead to injury or loss of life among protesters, many of whom are nationals of our countries, and whaling crews. We remain resolute in our opposition to commercial whaling, including so-called 'scientific whaling,' in particular in the Southern Ocean Whale Sanctuary established by the International Whaling Commission, and are disappointed about the recent departure of the Japanese whaling fleet for the Southern Ocean," they added. Japan's whaling fleet has set sail for the country's annual hunt in Antarctica, with security beefed up amid international protests. A coral reef damaged when a boat ran aground in the Florida Keys National Marine Sanctuary in 2002 has made an encouraging recovery after a nearly decade-long restoration effort. Hundreds of groundings happen in the sanctuary each year, and conservationists are hoping that this reef-restoration and monitoring effort will help inform future endeavours. The National Marine Fisheries Service has renewed plans that may lead to a listing of the ribbon seals under the Endangered Species Act, bringing to three the number of ice-dependent seals in Alaska that could be protected by the act. Crowds gathered to catch a rare glimpse of a humpback whale spotted off the coast of Shetland. The 50ft whale could be seen swimming within 200m of the shore of the south coast and are a rare sight off Shetland. The last to be spotted, in September 2010, became trapped in creel ropes, freeing itself just as a major operation was being organised. The MCS supermarket survey is the benchmark for seafood sustainability in UK supermarkets. Consumers put their faith in supermarkets to source sustainable seafood, and their survey is putting that trust to the test. They sent supermarkets a questionnaire to assess and score them in four key areas: their policy, seafood sales, labelling and consumer information, and sustainability initiatives. The results have revealed that some retailers are moving in the right direction towards sustainable sourcing, whilst others have made considerably less effort. Marks & Spencer and the Co-operative come out on top with a "Gold" medal standard, with Sainsbury’s and Waitrose picking up "Silver". None of the other major supermarkets reached a level that merited an award, and some refused to take part in the research at all. Pixar's wildly popular animated film 'Finding Nemo' gained near universal praise from fans and critics, earned numerous awards and accolades for its stars, and netted parent company Walt Disney Pictures over $860 million in box office revenue - the real losers, it turns out, are the real-life fish it portrayed. According to a new study which examined the extinction risk of the marine animals of 'Nemo' found that one in six species depicted in the film's animated aquatic setting run the risk of meeting a most un-Disney sort of end. Researchers from Simon Fraser University and International Union for Conservation of Nature (IUCN) report that while the health of Earth's ocean ecosystems are in decline, even the most charismatic, memorable marine species are feeling the pinch - and partially because they're popular. As species rise to public awareness through media, like the fish-rich 'Finding Nemo', it's often a boon to conservation efforts. But sometimes, say researchers, it has the opposite effect. Satellite tags have tracked a southern elephant seal nicknamed Jackson travelling for a whopping 18,000 miles (29,000 kilometres), the equivalent of going from New York to Sydney and back again. The Wildlife Conservation Society tracked the male seal from December 2010 until last month after conservationists with the group fitted Jackson with a small satellite transmitter on the beach of Admiralty Sound in Tierra del Fuego in southern Chile. The transmitter sends a signal every time the animal surfaces to breathe. Jackson then swam 1,000 miles (1,610 km) north, 400 miles (644 km) west, and 100 miles (160 km) south from the original tagging location, meandering through fjords and venturing past the continental shelf as he foraged for fish and squid. WCS reports that Jackson has returned to Admiralty Sound, the site of the original tagging. Each year, elephant seals haul ashore in colonies to molt and find mates. The satellite transmitter is expected to work until early next year, when it will eventually fall off. Whaling authorities of Japan are taking new measures to combat the militant U.S. environmentalist anti-whaling group, Sea Shepherd - they are taking the group to court. The Institute of Cetacean Research, along with masters of whaling vessels, have filed suit against the Sea Shepherd Conservation Society and their leader, Paul Watson, in an attempt to stop the sometimes violent interference in Japan’s annual whale hunt. This is the first time Japan has pursued legal action against anti-whaling campaigners. The Institute and Kyodo Senpaku, ship-owner, are seeking to obtain court orders from a District Court in Seattle, Washington, that would prevent the Sea Shepherd from engaging in all activities at sea that can cause harm to the crew, and vessels of whaling operations. Much like the fearsome star of the Alien movies, moray eels have a second set of toothed jaws that drag prey into their throats, a new study has found. In a series of experiments, scientists at the University of California, Davis, recently discovered that moray eels possess an extremely mobile set of jaws in their throat that they can project forward into their mouth to aid in feeding. However, unlike the fictitious alien's second mandible, which it menacingly extended toward its prey, the eel's jaws are much more practical. Ocean acidification - caused by climate change - looks likely to damage crucial fish stocks. Two studies published today in Nature Climate Change reveal that high carbon dioxide concentrations can cause death and organ damage in very young fish. The work challenges the belief that fish, unlike organisms with shells or exoskeletons made of calcium carbonate, will be safe as marine CO2 levels rise. A pure white albino lobster has been caught off the coast of Dorset. The snow-coloured beast was pulled from the sea by a fisherman who couldn't bring himself to eat it and instead handed it to an aquarium. Santa Claws - as he's been named - is now at home at the Sea Life centre in Weymouth, Dorset, where he has turned into a popular attraction. Santa is a one-in-a-million find and has been fortunate to be able to survive into adulthood. He was discovered in a lobster pot and is thought to be about 30-years-old. A massive influx of jellyfish shut down the St. Lucie nuclear power plant in late August, but it is only now that nuclear regulators, wildlife officials and marine researchers are learning that the event also killed several tons of protected goliath grouper. Jellyfish invasions of this magnitude are rare. Biologists at the plant could recall only three other similar events in the past 30 years. Japan has used funds from its tsunami recovery budget to subsidise its controversial annual whaling programme, environmental activists say. Greenpeace says 2.3bn yen ($30m; £19m) from a budget of 12.1 trillion yen is being used to fund extra security. Japanese officials argued when they applied for extra funding that whaling helped coastal communities. The whaling fleet reportedly headed for Antarctic waters this week, though Tokyo has not confirmed the reports. There has been a ban on commercial whaling for 25 years, but Japan catches about 1,000 whales each year in what it says is a scientific research programme. Your Shark Protection Efforts are Making a Difference! Two important steps for sharks have been taken in the past week as a result of all your hard work, spreading the word, shouting for sharks and petition signing! On November 22nd, the European Commission announced the long awaited proposal for closing the loopholes in the European Union’s ban on shark finning. And the European Union has become a signatory to the United Nations Convention on Migratory Species (CMS) Memorandum of Understanding (MoU) for Sharks. European fishing fleets play a major role in shark fishing worldwide with a number of loopholes in legislation which have long threatened sharks not just in European waters but globally too. Project AWARE have been battling this issue for the past few years and you’ve made your voice heard to help them get there. Thank you! In 2012, they’ll be pushing EU Member States to agree to the proposal for a strong, loophole-free EU finning ban. And they’ll be pushing harder for their goal to protect vulnerable shark species from trade under the Convention in International Trade in Endangered Species (CITES) at the next CITES meeting in Thailand in 2013. There’s much to be done between now and then. For now, thank you for supporting shark protection alongside Project AWARE. Welcome to this week's Marine News Roundup. We hope you enjoy these marine-related stories - leave us a comment below and let us know what you think! Facts, numbers, data, letters on a page; they're not always so easy to understand. Over the past few years data visualisation has become increasingly popular; it's a way to help explain complex data. Here, BBC Earth demonstrate two alternative ways to show how the extent of Arctic sea ice has changed over the past 20 years. People who eat baked or broiled fish on a weekly basis may be improving their brain health and reducing their risk of developing mild cognitive impairment (MCI) and Alzheimer's disease, according to a study presented today at the annual meeting of the Radiological Society of North America (RSNA). Researchers have discovered what makes the shark almost impossible to outswim. By using an engineering imaging technique, researchers have discovered that as a shark’s tail swings from side to side, it creates twice as many jets of water as other fishes’ tails, smoothing out the thrust and likely making swimming more efficient. Sharks do this by stiffening the tail midswing, a strategy that might one day be applied to underwater vehicles to improve their performance. More than 50,000 people are calling on the government today to create a network of marine protected areas (MPAs) for wildlife. Wildlife enthusiasts are to be given access to binoculars and information panels to identify their favourite marine animals and birds at a number of vantage points around the Isle of Man. The project, which involves five different sites around the coastline, has been planned for some time but has now been given a kickstart with a donation from Barclays Wealth. Major seafood businesses who are frustrated with the lack of progress to overturn the practice of discarding edible fish at sea have joined the Sustainable Seafood Coalition. Sustainable Seafood Coalition members have voluntarily decided to sell seafood that is currently underutilised or discarded and to encourage consumers to eat a wider variety of sustainable seafood. Recent research on the mating behaviour of fish has proved that certain species practice the "one husband one wife" rule even when in a school, researchers have recently announced. The phrase "shark attack" is sensationalist and damaging – bites by sharks are often investigatory or defensive. To suggest that shark-on-human encounters should be called predations would be wrong. The way sharks encounter seals is fundamentally different from how they treat humans. The time is right for science to reconsider its use of the phrase "shark attack" on humans. Such language creates a one-dimensional perception of these events and makes protecting threatened shark species more difficult. After all, why care about an animal that wants to eat us? Wildlife officials are trying to determine the cause of death of a killer whale that washed ashore on a Point Reyes beach. The orca was a male juvenile, about 18 feet long, that had washed up in an isolated area along Driftwood Beach, just north of McClure's Beach. Early necropsy results indicated blood in the blowhole and a blood clot in the head. No determination as to cause of death has been made yet. An albino seal that was rejected by his family for 'being ginger' has become a huge hit with tourists at her new home in Russia. Cod has played a central role in the cultural history and economic development of New England fishing communities for more than 400 years. In recent decades, however, the story of the humble cod has shifted to one of destruction. Modernised technologies and more efficient fishing methods along with increased competition and toothless regulations have guided the cod industry to the brink of collapse. The owner of Shark's Fin City, a dried fin wholesaler in Hong Kong's quarter for all things shrivelled, says there are only a few people who know the truth about sharks, and he's one of them. Like many Hong Kong businessmen who trade in shark fins, Kwong Hung-kwan believes his industry is being targeted by an anti-Chinese conspiracy led by "Western" environmental groups like Greenpeace. Talk of a dramatic decline in shark populations around the world is rubbish, he says, dismissing research showing an eight-fold jump in threatened shark species since 2000. A two-week-old grey seal pup returned to the oil supply boat after he was put back in the sea. The pup is being treated at the Highland Seal Hospital near John O'Groats after surviving a marathon 100-mile journey. Named Viking, he was rescued after crew on the Subsea Viking found him sheltering on the boat, 120 miles north-west of Shetland, last week. The seal, which still had his fluffy yellow coat grey seals are born with, had clambered aboard and made himself at home on the platform used to launch remote-controlled vehicles.